Hanoi (VNA) – The sixth Zhejiang Export Fair in Vietnam kicked off at the International Centre for Exhibition in Hanoi on August 3 with the participation of over 100 businesses from the Chinese province. Taofei, head of the Zhejiang business delegation, said the participating companies represent the “Zhejiang Made, All Need” symbol. They are prestigious firms and have generated considerable economic benefits for the province. 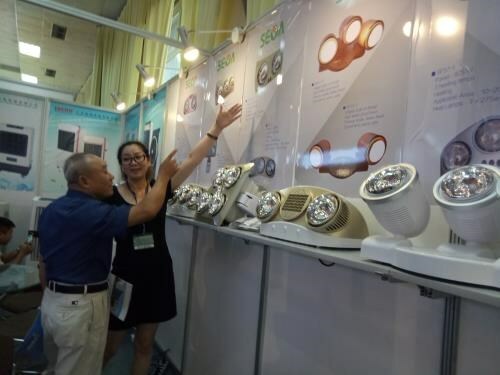 The 150 booths at the event showcase machinery, electrical and electronic equipment, construction materials, interior decoration, metals, textile-garment and materials, and consumer goods. To Ngoc Son, deputy head of the Asia-Pacific department under the Ministry of Industry and Trade, said the sixth Zhejiang Export Fair in Vietnam is one of the biggest of its kind in Southeast Asia. It continues to be an opportunity for Vietnamese and Zhejiang firms to optimise their advantages, increase experience sharing, and foster export-import activities, helping to fuel Vietnam-China trade, he noted. He added his ministry will coordinate with relevant agencies of China to take various measures to promote bilateral trade. The Vietnamese and Chinese trade ministries are also working with the Zhejiang administration to finish procedures for the opening of a trade promotion office of Vietnam in Hangzhou city this year. Taofei said Zhejiang boasts the most favourable natural conditions and the fastest economic growth rate in China. It has set up direct economic relations with more than 230 countries and territories around the world. The province’s total trade revenue reached 33.64 billion USD in 2016, including 26.78 billion USD of exports. Trade turnover between Vietnamese localities and Zhejiang hit 6.7 billion USD in 2016, up 12 percent year on year. While 186 Zhejiang businesses have poured 1.68 billion USD into Vietnam, 26 Vietnamese firms have also invested in the Chinese province with total capital of 20 million USD. Vietnam is currently the biggest trade partner of Zhejiang in Southeast Asia and also a big investment destination of the province’s enterprises.